Letters of Fashion : Are Kylie and Kendall planning a fashion line??? OK So I have just been reading on Twitter and all over female magazine sites that rumours are... Kendall and Kylie MIGHT be planning their own new fashion line! This would be my dream come true! (As long as it was affordable fashion of course!) is it just Topshop they are planning or something new? So everyone's following Kylie on Instagram right?? Well yesterday she 'Instagrammed' a pic of her wearing the below outfit saying 'go ahead and follow @KendallandKylie for sneak peaks'. So of course, I head straight over to have a look and there are images shared of them brainstorming fashion designs, and outfit plans. I did once consider this to be rubbish and another fake' rumour' however after instagramming the page herself (Kylie) Its looking promising girls!! They even have a Twitter account in the same name!! 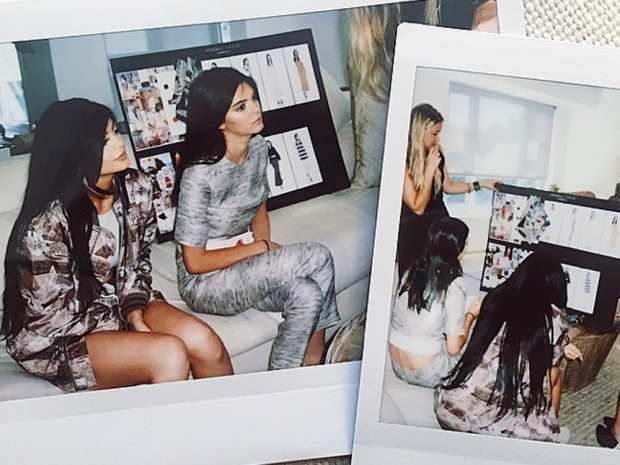 Are you excited for a potential Kendall and Kylie collab? ?